Ferns are one of the oldest classifications of plants. 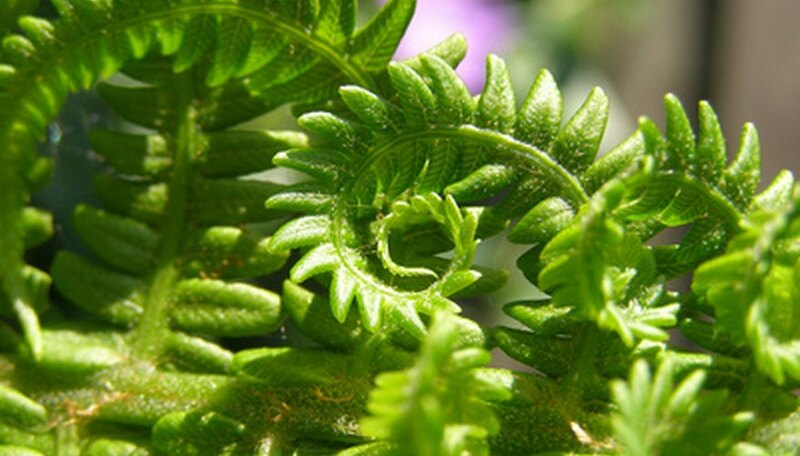 With curly fiddle heads, lacy fan-like fronds and lance shaped spears, ferns come in many enticing shapes and sizes. Growing this ancient group of feathery, verdant green woodland dwellers can be done indoors and out, provided they are given the right growing conditions and nourishment. Provide the right kind of food for your fern and watch it thrive. Many ferns benefit from the quick release and easy digestion of a liquid fertilizer. Feed the Boston, pteris, and petticoat ferns fish emulsion, which is processed fish waste. Typically, fish emulsion comes in solid, mixable with water, or liquid form. Although this fertilizer is known for its less-than-pleasing aroma, it provides a great organic balance of nutrients when used per manufacturer directions. One application every three to four months is generally adequate. Davillia fejeensis, the rabbit's foot fern, is an indoor species with creeping, fuzzy tendrils that prefers a liquid houseplant fertilizer. Including a balance of nitrogen, phosphorus and potassium, liquid fertilizers provide quick release and easy application for indoor plants. Cut the label-recommended dose in half and pay attention to how your fern responds. If yellow or browned foliage results, cut the dosage further and extend the time in between feedings; this symptom means your plant does not need the extra food. Most ferns, including the asparagus fern, can also benefit from a granular, slow release plant food applied over the soil's surface. These granules have a similar composition to liquid houseplant fertilizer but must be applied only to the surface and only on moist soil. Water well before and after application. The asparagus fern may tolerate a half dose of slow release food weekly, but pay attention to your fern for cues of over-fertilization. A particularly special form of fern, the staghorn (Platycerium bifurcatum) rests on a piece of redwood bark with soil-free potting medium as its food source. Flat and round, silvery fronds grow in the medium on the wood with the addition of daily moisture. Yearly reapplication of this potting medium will ensure the proper balance of nutrition for the fern. Combine equal parts sphagnum moss pieces, peat moss and oak leaves for the perfect staghorn fern food. Most ferns grow best in potting mediums composed of at lease three-quarters peat or sphagnum moss. This is due to the drainage properties of the natural product, as well as its inherent nutritious properties. The great news for ferns is that decomposing sphagnum moss will provide a slow, long-term release of food for your ferns. Be sure to pot or plant ferns with plenty of this rich food mixed in for bonus feeding over the life of the plant.